The cloud storage data placement auditor mechanism is used to govern and control where datasets can be stored. This mechanism can be used to enforce policies on where each dataset can or cannot be stored and perform frequent checks and audits of each dataset’s storage location to ensure the appropriate cloud storage device is used according to requirements established in the service contract. 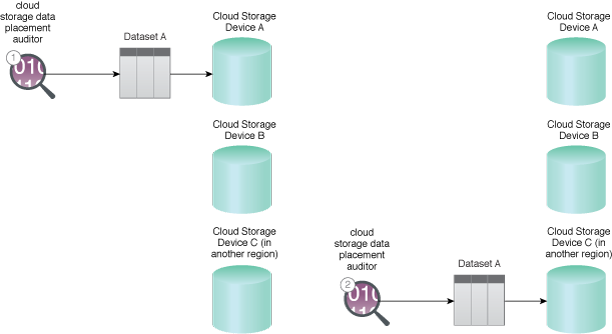 As shown in Figure 1, the cloud storage data placement auditor mechanism checks compliance and regulatory policies against where data is actually stored. This is performed in case a dataset should not be hosted in the region in which the cloud storage device is located. Figure 1 – The cloud storage data placement auditor mechanism checks compliance and regulatory policies of Cloud Storage Device A (1) to determine the dataset’s relocation into Cloud Storage Device C (2). This mechanism is generally established via the use of APIs, ADKs, a policy engine, and the SLA monitor mechanism.